Update: The boys have played with this sand for months. Until we moved and we couldn’t move a filled sand box. I made it again and what I have learned in the meantime is definitely make sure the sand doesn’t get wet. If it gets wet, let it dry first, before playing with it again. Since the sand is a bit sticky, it doesn’t feel as dry as I had expected (I think that was why I was not really happy with the result), I have dedicated sand toys now. Also, using a different type of sand really helped. Where I had used reptile sand before, with the new batch I used Safe Sand for Sandbox Natural White Playsand. Again I used a big bag of 25 pound and a 500ml bottle of Dimethicone. I am happy with the result and the boys are happy they can play again with this cool sand. Our first try out of making kinetic sand or moon sand. I’m not really happy with the result, but the boys love it. I used 25 pounds of White ReptiSand® and a 500ml bottle of Dimethicone, both bought at Amazon. As we speak Maximan is building a skate park, from Sand. And he wants to build a volcano. A bit short, but duty calls. Let me know if you have questions. I would love to make a diy kinetic sand at home for my kids. After playing with this for a while do you recommend this recipe? I hate to purchase the ingredients if it didn’t work as you hoped but you’re the only person I’ve found with any kind of recipe that might mimic kinetic sand(not moon sand) with any sort of success. Thanks so much! Hi Amanda, after playing with it for a while, I wouldn’t recommend it. It irritates the h… out of me that not only the sand behaves in the way you want too. But everything gets sticky and it is so hard to clean. I am planning on doing more testing. 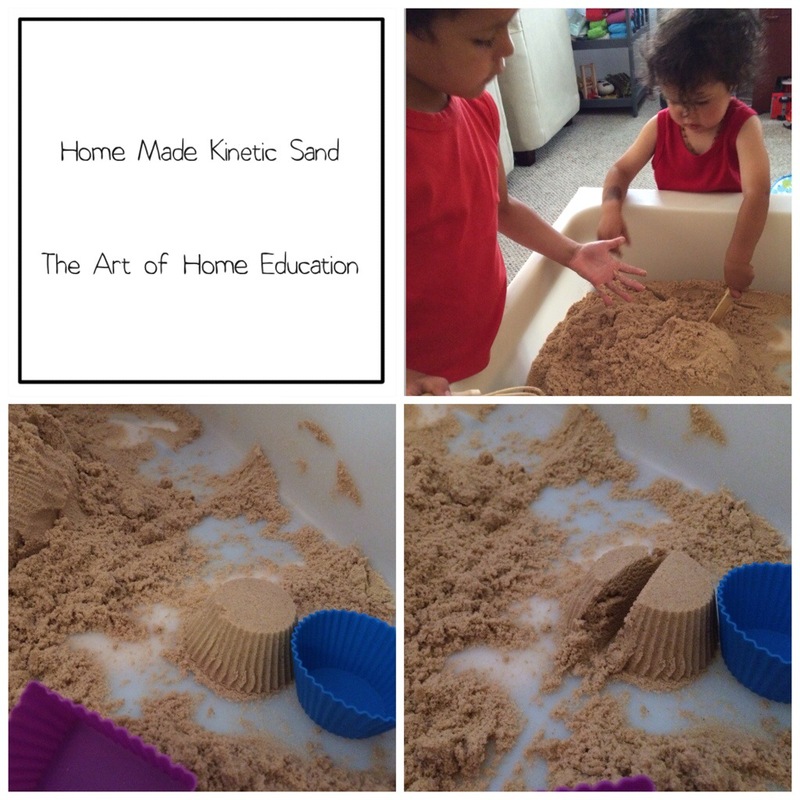 Do you still like the kinetic sand or have you made any changes to it that helped? Also, where did you get the form drawing toys/puzzles for the kids? I can’t find them anywhere, probably because I don’t know what they’re officially called. Thanks! Hi Abs, the kinetic sand didn’t turned out that well. I am thinking of trying something else. I got the form drawing at a thrift store some years ago. Which puzzles are you referring too? Hi Abs, we tried it again. See the update. Does your updated recipe act like kinetic sand with movement? Does it stick to hands and clothes, get under your nails? Just want to make sure it has the same qualities before I purchase items to make my own. I’ve found several recipes that do not measure up. Also, does it dry out over time? Thank you! It doesn’t dry out over time but it does stick a little to your hands. I use normal play sand instead of really fine sand which made it a bit better. Let me know how it goes. How did you mix things? Small batches? Any water or just the 2 ingredients? No water. The sand should stay dry. And I did add the dinethicone in small amounts at the time and see how the mix would feel and react. I also tried making kinetic sand. I used play sand, Silly Putty, and a few drops of silicone oil. The texture was acceptable, but not quite there. Is dimethicone sold in stores? If so, any idea what type of store or which department in the store? Maybe at a pharmacy. I got it from Amazon. There is a link in the article.